Already nine games into the season and the Jets are only playing divisional opponent number two tonight in Tampa Bay. The Jets dispatched the Carolina Hurricanes earlier on October 22nd with a 5-3 comeback victory in the first game against a team from their own Southeast Division. Now they will see how they stack up against the powerhouse offense of Steven Stamkos, Vincent Lecavalier, and Martin St. Louis in Tampa. The Lightning have a .500 record so far this season, highlighted by winning three of their last four. Head coach Guy Boucher's club started the season off very rough, going 1-3-2 before winning three straight from October 20th to 25th. Their last tilt was a 5-3 loss to the Nashville Predators. 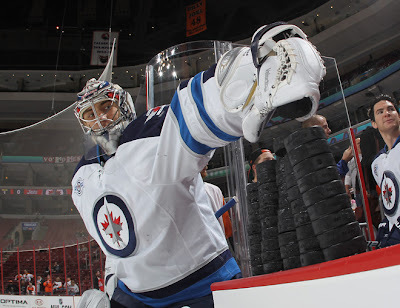 The Jets, meanwhile, will have a quandry to who will start in net. All likelihood will be Ondrej Pavelec as Chris Mason, who replaced Pavelec in the Philadelphia game Thursday night, left that game with a groin problem. Nik Antropov and Alexander Burmistrov co-lead the Jets in points with nine apiece - the only two Jets who are point-per-game players thus far this season. Both have three goals and six assists. Add to that Burmistrov is a club best +3 this season. Game time is 6 PM CT and is available on CBC's Hockey Night In Canada.